The Milwaukee Bucks' Ersan Ilyasova (right) is defended by the San Antonio Spurs' Tim Duncan (left) and Boris Diaw as he tries to shoot. SAN ANTONIO (AP) — The San Antonio Spurs needed a pick me up after a disappointing loss and a series of injuries, and they got it Sunday night by stepping all over the Milwaukee Bucks. Patty Mills had 20 points, Tim Duncan had 11 points and 13 rebounds in limited action, and San Antonio rolled to a 110-82 victory over Milwaukee that kept the Bucks winless in the new year. Marco Belinelli scored 14 points, Jeff Ayres and Nando De Colo had 13 points apiece, and Kawhi Leonard added 11 points in 21 minutes for San Antonio. After hanging their heads following a 109-100 loss to the Portland Trail Blazers on Friday night, the Spurs were feeling pretty good after trouncing the Bucks. "(My confidence is) going through the roof, man" Ayres said. "You don’t see me out there? I’m having fun, dunking on people and stuff. It’s awesome. Life is good." Even San Antonio coach Gregg Popovich was in a light-hearted mood, joking about the season debut of athletic, 6-foot-9 forward Malcolm Thomas. "I thought he was real active," Popovich said. "He blocked (two) shots. You know we don’t block shots; that’s not part of our program . that’s a joke." The merriment came at the expense of adding to Milwaukee’s misery. The Bucks have lost nine straight, dropping those games by an average of 15 points. Making matters worse for Milwaukee, starting off guard Luke Ridnour left the game after spraining his right wrist late in the first quarter. The wrist bent back after it was sandwiched between Mills and Ekpe Udoh as Ridnour attempted to roll off a screen. He still attempted a 19-foot jumper, but feverishly signaled for a sub as he clutched his wrist in pain. "The X-rays were negative, which is a good sign," Bucks coach Larry Drew said. "Right now it looks like he’s in a splint and I don’t know how long he will be out." It swelled right away, as soon as he did it and that was a big concern. I guess we’ll go back and I believe he’ll get an MRI." 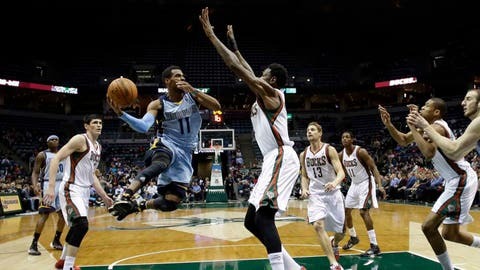 Brandon Knight scored 21 points, Giannis Antetokounmpo added 11 points and John Henson had 10 points and 11 rebounds for Milwaukee, which trailed by double digits the entire second half. San Antonio played without starters Tony Parker and Tiago Splitter, former starter Danny Green and 3-point specialist Matt Bonner. Parker missed the game with a bruised right shin that stiffened in the second half of the Spurs’ loss to the Trail Blazers. "We were missing a lot of guys so that was a little worrying, but overall I think we did a good job," San Antonio guard Manu Ginobili said. "Everybody got to play and everybody played well. Guys made shots and it’s a good feeling." The Spurs bench scored 58 points, with only one coming from Ginobili. Duncan played only 27 minutes, sitting out the fourth quarter as San Antonio built its lead to as many as 28 points in the second half after breaking the game open early. The Spurs went on a 15-0 run bridging the first and second quarters, taking a 29-16 lead that essentially put the game out the Bucks’ reach. Milwaukee went scoreless for five minutes, missing six shots, committing two turnovers and an offensive foul. Henson’s 20-foot jump hook with 11:18 remaining in the first half ended the drought. Mills opened the run with the first of his four 3-pointers, sinking a 25-footer with 4 minutes left in the first quarter. "They move the ball, they make the right play and they get the open shot," former Spurs guard Gary Neal said. "Patty was the recipient of good ball movement today and he was able to knock the shots down. You have to give credit where credit is due, that system has been in effect for a long time and it’s been successful for a long time." Even the notoriously tough Popovich was able to give his team a figurative pat on the back afterward. "Coaches are sick puppies," Popovich said. "There’s always things you can improve and do better. You look at the film, try to keep your standard and get ready for playoffs, but overall it was a good performance." Notes: Parker received the La Gazzetta Dello Sports European Player of the Year award before the tipoff. Parker led France to its first European Championship in the offseason. . . . Former Spurs G Gary Neal was greeted by apathy when he entered the game, receiving little reaction in his first game in San Antonio since leaving in the offseason as a free agent. . . . Bonner missed the game with a broken nose he sustained after taking an elbow from the Trail Blazers’ Thomas Robinson in the first quarter Friday night. . . . Spurs analyst Sean Elliott quickly grabbed his notebook and paperwork during the first half when Duncan walked toward the scorer’s table with a mischievous grin. Earlier this month, Duncan playfully tossed Elliott’s things during a timeout. Duncan laughed as he stood over Elliott, failing to find anything to toss at his former teammate. . . . San Antonio’s mascot, the Coyote, made a behind-back, three-quarter-court shot during a timeout.